« NEWS: Construction on the WTWS? 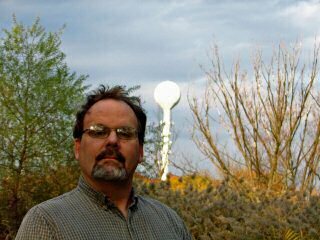 Steven F. Scharff, former Union resident, now of Henderson, Nevada, shares this portrait of self with illuminated tower taken by John R. Scharff on 2008/11/01. The World’s Tallest Water Sphere is gleaming white and certainly is the center of attention of this photograph. Your eyes cannot but help but be drawn to the giant spike of whiteness slashing down the center of the photo. Steven looks a little bit like my older brother, and his face shows a bit of seriousness of the task at hand, while at the same time being proud to see the WTWS in person. If you have a photo, artistic, portrait, or historic, please share it with the site, and it will be awed by the world. This entry was posted on Sunday, November 16th, 2008 at 5:49 pm	and is filed under History, Photos. You can follow any responses to this entry through the RSS 2.0 feed. Both comments and pings are currently closed.